Joel Feder February 11, 2019 Comment Now! Italian cars are known for four things: beauty, speed, noise, and a special feel. Fail on any of these and the car feels authentic like ravioli from a can. 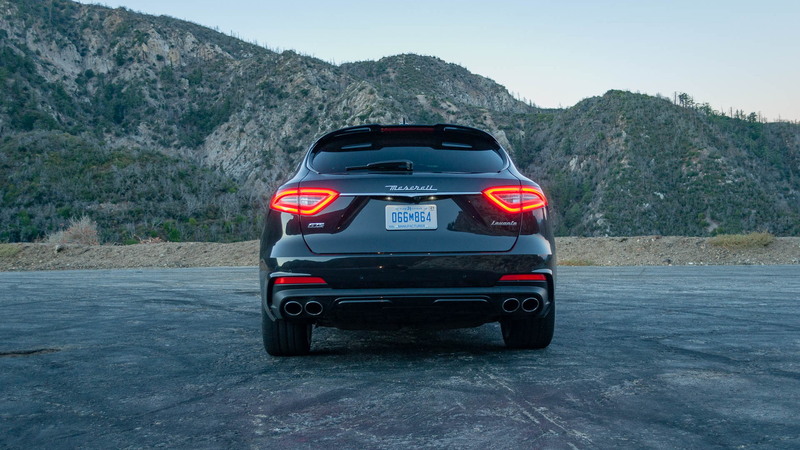 Maserati’s Levante is the Italian automaker’s first crossover SUV. It’s beautiful, but base models weren’t fast, didn’t sound good, and hardly felt special. Mamma mia. 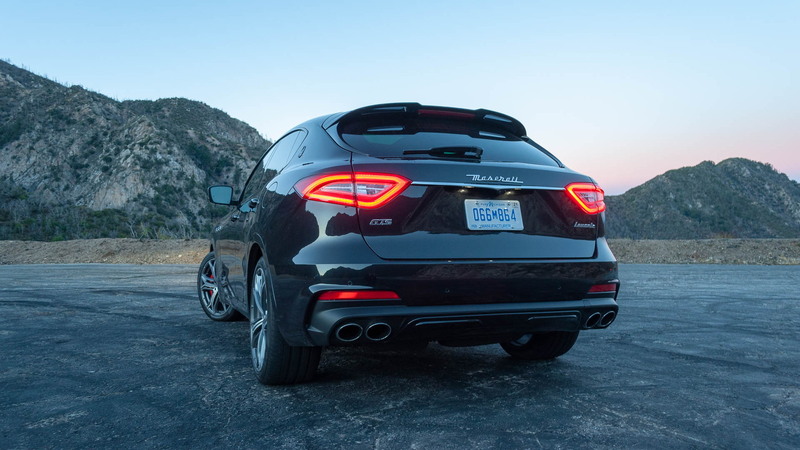 For 2019, Maserati stuffed a twin-turbo V-8 under the Levante’s hood to create the GTS model. Faster? Yes. Louder? Sure. Special? We’ll get to that. The standard Levante’s beautiful to the point of people staring, but the GTS takes those organic shapes and adds just enough flair to snap necks. Massive intakes sit beneath the gaping grille while $2,200 optional 21-inch Helios staggered wheels filled the wells of my tester. The strong rear haunches make the Porsche Cayenne look soft and flabby in comparison. The Levante is achingly gorgeous, and one of best-looking SUVs on the market. Open the door and there’s a click from the door latch mechanism that sounds straight out of a Ferrari. Just like a Prancing Horse, everything inside is covered in leather (bright red in my tester), soft-touch materials, and real carbon fiber trim (for a cost of $2,490), except what isn’t. Spend a few minutes in the cabin and that special feeling fades. The turn signal stalk in the Levante is out of a Chrysler Pacifica minivan, and the window switches in the Maserati are in nearly every other FCA product including a Dodge Journey—save some chrome trim. These bits are fine in a $30,000 crossover and $40,000 minivan, but feel hollow and cheap in a luxury SUV that costs $100,000 more than those pedestrian family haulers. FCA’s easy-to-use Uconnect 8.4-inch touchscreen system sits front and center on the dashboard just like in a Jeep Grand Cherokee, only the two rotary knobs to control the volume and tune have been moved to a stacked configuration on the center console behind the shifter. It’s awkward to change the radio volume, and the larger ring doesn’t control the tune, rather, it moves the selector around the screen for no real reason as it’s a touchscreen. I pushed the start button straight out of a Dodge Challenger and forgot those cheap parts bin switches as the Ferrari-built, twin-turbocharged 3.8-liter V-8 fired to life its 550 horsepower and 538 pound-feet of torque with a low, muted burble. If only it could be started with the exhaust baffles open to wake the any breathing creature within earshot. Just before daylight broke I tipped the 8-speed automatic transmission into drive and pointed the high-riding Italian crossover toward the base one of California’s best driver’s roads, Angeles Crest Highway. Just ahead of the huge grille-mounted Trident was a Velocity Blue Ford Mustang with the Performance Package Level 1. In normal Drive mode the Levante GTS kept pace with the blue Mustang, but it had more in it. I pushed the Sport mode button and the exhaust belted an Italian scream through the dark, chilly air as the electronic baffles opened, the pedal map became more sensitive, transmission shifts quickened, dampers were put into comfort mode (an odd, but rather good, choice), and the ESC calibration loosened the reins a bit. 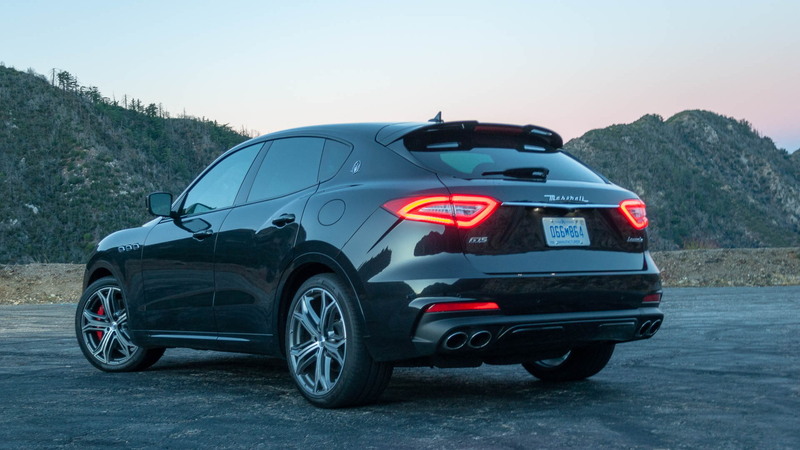 The changes not only allowed the Levante GTS to keep up with the blue sports car ahead of it, but also suddenly the Italian crossover SUV was on the pony’s bumper. I backed off, out of courtesy. After a stop for photos above the clouds, I pulled the Nero Ribelle (that’s fancy Italian for metallic black) out in front of the blue Mustang and put the suspension into its Sport mode. This lowered the ride height 20mm to Aero 1 mode and activated the firm damping map for the active damper. With the gear selector in manual mode I grabbed the steering-column mounted massive carbon-fiber covered shift paddles as the Italian launched forward viciously. “This can’t truly be a crossover SUV” is all that kept going through my mind over and over again. I flicked through the gears on a long, straight stretch of open asphalt before I engaged the massive six-piston calipers on 15-inch rotors up front (and 13-inchers in the rear) to haul things back to reality before the next turn. No matter how hard Levante GTS’s was pushed the rear end stuck to the pavement like Gorilla Glue as the Q4 all-wheel-drive system distributed power and the Pirelli P Zeros dug into the pavement to pull the high-riding hatchback around each corner. The well-weighted steering is a perfect companion around town and on the twisty corners of Angeles Crest Highway, but it didn’t communicate as much information to the steering wheel as Porsche does with its electric power steering. Maserati just isn’t there yet, but it’s close. The Levante shouldn’t have launched with a 345-hp twin-turbo V-6. It deserved a V-8 under its hood. 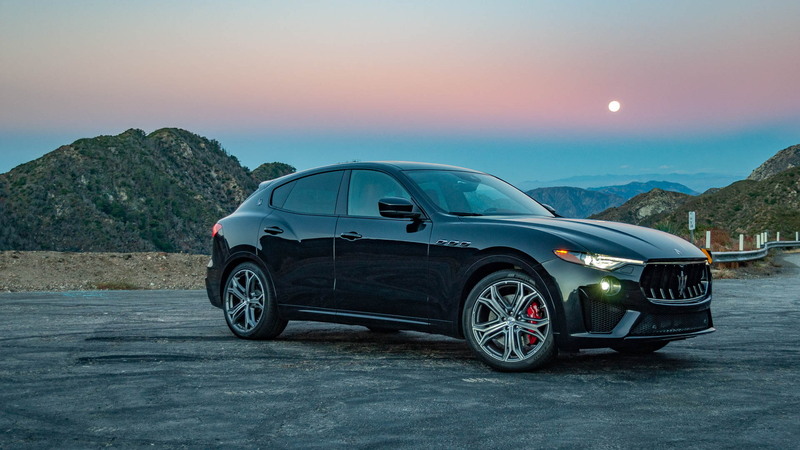 For 2019, the GTS model gives the Levante lineup what it needed. While the Levante GTS starts from $121,475, my nicely optioned tester rang in at $133,250. That’s just slightly more than a base Cayenne Turbo, before options. The Maserati looks far more special, aside from a few bits inside it the cabin. 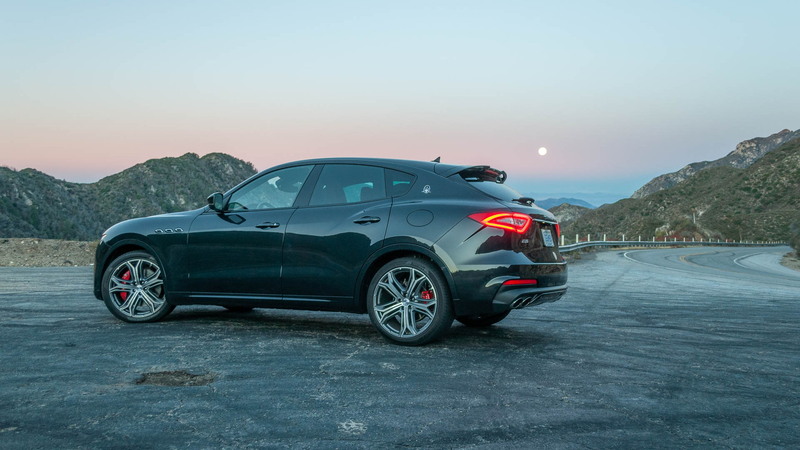 With the GTS’s twin-turbo V-8 engine the Levante finally has the the speed and mechanical soundtrack to match its svelte shape, it’s just a few details short of delivering on the special feeling implied by the Maserati badge. “Sir, that’s a beautiful car. Not everyone can be Italian, right?” a man at the beach in Santa Monica asked.